Smell the Cork! 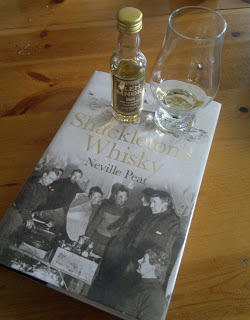 : Shacketon's Whisky, sort of. The short version of this review is that neither the book or the whisky are outstanding, although both are enjoyable, and of course there is an added interest in the Glen Mhor since the distillery is long silent, a victim of the downturn of the early 1980s. The story of Shackleton's expedition to Antarctica is fascinating. On the other hand, it's clear from reading the book that the 300 bottles of whisky which travelled south from Scotland were no more or less important than the 450 tins of baked beans, and certainly less important than the 300 bottles of lime juice, which were brought along to help guard against scurvy. I found it irritating that Peat continually speculates as to the various expedition members' thoughts about the whisky - it's about as illuminating as speculation regarding their thoughts on the beans or the lime juice. I would also say that he gives rather too much credence to Richard Paterson's enthusiastic evaluation of the recovered bottle. And I can see no reason at all to believe that Macinlay's would have been a vatted malt or single, despite the assertion by Dr Richard Pryde of Whyte & Mackay that "there's no sign of grain whisky in it." Surely the whole point of grain whisky (at least as far as blending is concerned) is that it is neutral or dull or bland; it does not contribute flavour. The whisky is very light for a twenty-five (or -six) year old. There are some notes which could be long wood contact, but essentially this is a delicate, lactic spirit, with some apple notes. I was reminded somewhat of Bruichladdich, albeit without the finesse which characterises the Laddie. I enjoyed it, but it doesn't really fit the profile which this book gives to Mackinley's. Perhaps the quality of the whisky had declined by 1980. My quibbles aside, the book is a quick and interesting read, and it was definitely fun to drink the Glen Mhor while dipping into the book.